We update our online model library every month and summarize the changes in the WhatsNew document. Each update makes the latest tools and improvements available to all users immediately. In July, we continued our work to simplify tools and make them easier to apply, focusing on models that work with heat flow (Qr-Qb) data and on crystallization operations. Over the next 6 months, other application areas will receive the same review and enhancement. We are fortunate to have Dr Wilfried Hoffmann in our team, who after nearly 29 years at Pfizer, with responsibilities and expertise ranging from thermochemistry to PAT and modeling, joined our team in 2012. Wilfried led the review of the heat flow models and the changes reflect his experience and expertise. Simple models allow rapid estimation of kinetics with very little input data and separate models translate the chemistry (by copy and paste) to larger scale conditions. Search for 'Qr' and 'exotherm' in the DCR search box to find these tools. Decomposition reactions can be included easily alongside the synthetic chemistry reactions and safety scenarios can be explored to minimise 'accumulation' or maximize the time to maximum rate (TMR) after a cooling failure. Many of you will have seen the 2013 webinar by Bernhard Berger of Siegfried in this application area; if not, it is well worth your time to review. The crystallization library was also enhanced with a clearer workflow among the various tools involved and consistent, rigorous kinetics applied across all models. The previous blog post highlighted some excellent results achieved using these models, using Lasentec (CLD) data to obtain the kinetics of the true crystal size distribution (CSD), taking account of particle shape. There will be webinars in both application areas later this year to review the improvements. See the list of current events anytime by visiting here. There are lots of tools for modeling in various forms and it is sometimes hard for practitioners to see the best way to proceed. It would be interesting to measure the percentage of scientist and engineer time spent staring at Microsoft Excel spreadsheets, writing formulas, plotting data and hoping for inspiration. Or at the other end of the spectrum, writing low level computer code to implement mathematical analysis, repeating the same bugs and logic errors as everyone else who has tried. In our busy industry, it is a mistake to think that this activity adds maximum value. The effort required just to make such a model understandable to others is more than you can afford and many projects produce dead branch tools, perpetuating the problem. Into this space, we project DynoChem, the industry standard tool for fast modeling of equipment (mixing, heat transfer), properties (especially common solvents and proprietary compounds), reactions, crystallization, distillation and downstream operations. The speed of model creation from existing libraries is impressive and models can vary from the very simple to extremely complex. Teams with industrial experience and PhD qualifications help to develop the tools, support customers and train users globally. New user communities grow within industry, tackling downstream operations, product stability and product performance at the point of use. In spite of being the market leader, we are only beginning. There is much more impact to come, as users turn away from general purpose calculators towards tools that are fit for purpose. Helping make that transition, we continue to make our tools simpler and at the same time more powerful, the latter being the main subject of today's post. Among the toughest simulation problems is predicting the shape of a crystal size distribution (CSD). Fortunately, many problems with CSD can be solved without predicting CSD shape; in fact the mainstream way to solve these problems remains trial and error, mixed with sometimes endless experimentation. For nearly 15 years, we have helped crystallization users to be more rational and scientific about solving CSD problems by taking a systematic approach and substituting thinking for some of the experimentation. Advances in computing technology have brought CSD prediction within the realm of the standard PC, as long as users do a few appropriate experiments to fit model parameters. We added prediction of CSD shape to our online model library in 2012 and recently completed a further iteration to make this capability more powerful and easier to apply. We are delighted that DynoChem has the most accurate tools for prediction of CSD shape in the industry, with models using both finite volume (fixed size classes) and the method of characteristics (moving size classes). The latter method is extremely attractive as it contains no 'numerical diffusion', a problem that afflicts any PDE solver using the finite volume method. No other process simulation software offers this method, as far as we are aware. We also have the best solubility prediction tool and the fastest solubility regression (takes < 1 minute from data input to model completion, compared to other tools that require hours and specialized expertise). For CSD shape prediction, we concentrate on nucleation and growth models. Our workflow involves several tools in which each performs a single task, including conversion of apparent CSD (for example Lasentec data) to moments, fitting a solubility curve, fitting nucleation and growth kinetics, predicting true CSD shape, comparing true CSD and apparent CSD using particle shape information, refitting the kinetics if necessary and making definitive predictions of true CSD. Some example results for CSD are shown below. Each graph was produced using our moving size classes model, which captures the distribution accurately with no numerical diffusion. Contact our support and training team if you'd like to discuss this application with us. 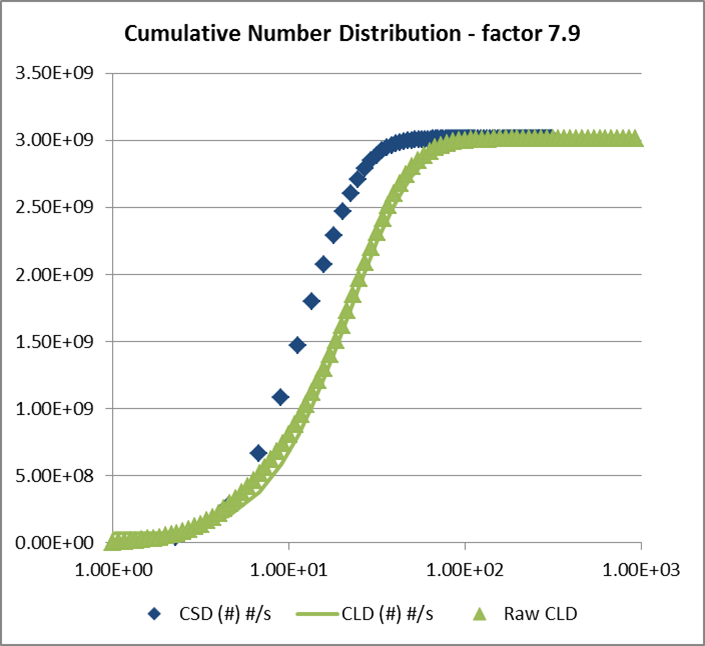 Figure 1: Our workflow produces excellent agreement between predicted and measured number distributions for CLD in this example; navy points are the predicted CSD from the population balance model; green points are the measured CLD; the green curve (hardly visible under the green points) is the predicted CLD when the CSD is converted using our virtual CLD probe, knowing the crystal shape. Figure 2: Crystal number density distribution, n(L), plotted versus size for the same example. 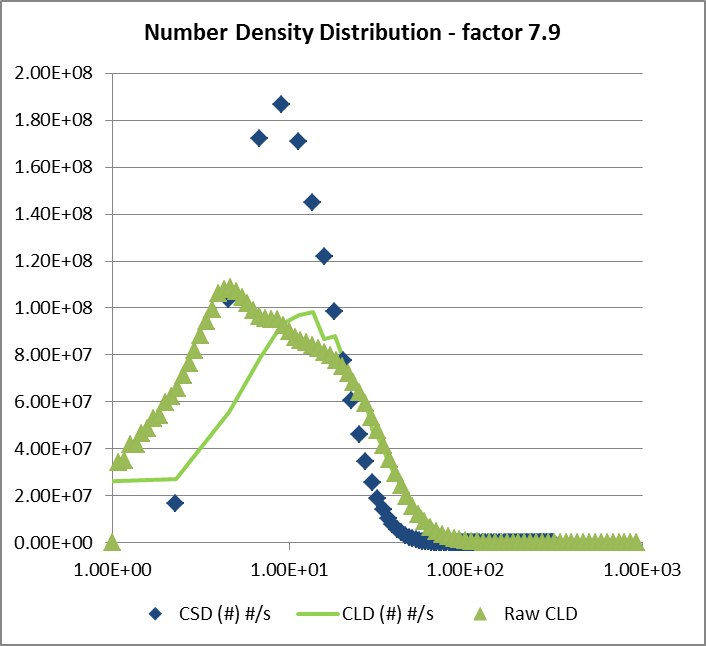 When particle shape (aspect ratio) is taken into account, our virtual CLD probe indicates the conversion factor between CLD and CSD, which allows the true CSD in the L dimension (navy points) to be fitted to CLD data (green points) sampling all dimensions. The fit may then be checked using the virtual CLD probe (producing the green curve from the predicted CSD). 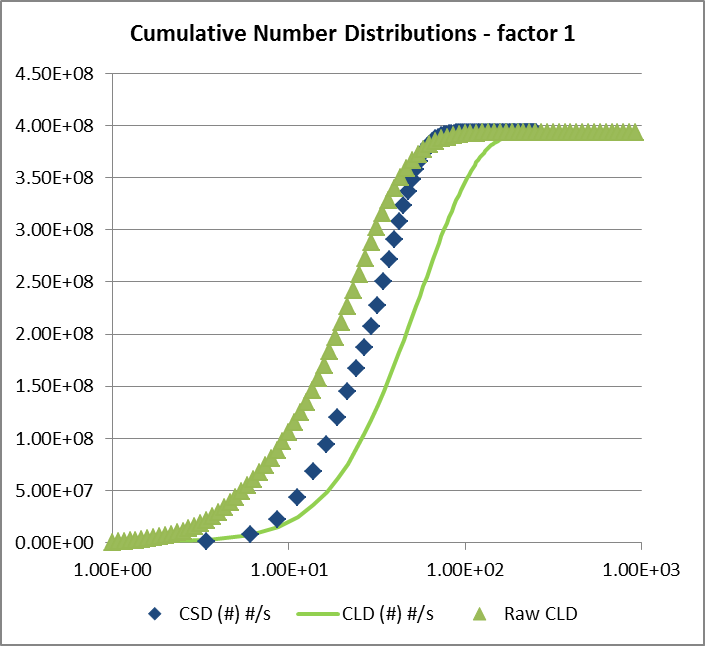 Figure 3: When measured CLD and true CSD are assumed to be equivalent (no correction for particle shape), the cumulative number distribution for CSD predicts a CLD that is too large in this case compared with the measured CLD. 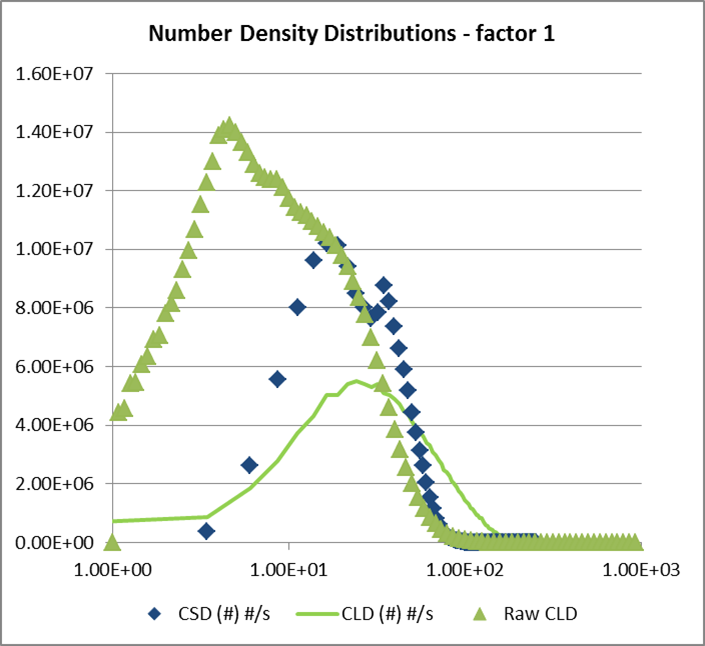 Figure 4: The impact of treating CLD as CSD is shown more clearly from the number density distribution, n(L) plot. When predicted CSD is converted to a CLD by the virtual CLD probe, predicted and measured CLD (green curve and points) do not agree. In this example, the predicted CSD assuming this 1:1 equivalence and without accounting for particle shape contains a slightly bimodal distribution, due to differences in timing between peaks in primary and secondary nucleation. This feature disappears (see Figure 2 above) when the correct CLD-CSD relationship is included in the model. Careful measurements of fed batch process dynamics in antisolvent crystallization systems are quite few and far between. A useful paper by the UCD Crystallization group from 2007 showed effects of agitator speed and antisolvent addition rate on the observed metastable zone width (MSZW) of benzoic acid crystallizing in ethanol/water. An FBRM probe was used to detect the onset of nucleation and MSZW was generally wider at higher addition rates. MSZW was also a little wider at higher agitation speed when the feed point was not well located (above surface near the wall of the vessel). It became narrower with higher agitation speed when the feed was more directly into the impeller suction, an effect that can be explained by the dependence of nucleation rate on agitator speed. Higher than average supersaturation exists near the feed point and this can lead to premature nucleation, or a negative MSZW; this was observed in the UCD study at the less effective feed position. CFD calculations of the flow patterns in the lab vessel were used to explain some of the mixing effects. A paper from the UCD group in 2011, based on research in the SSPC consortium, included analysis of relevant turbulent mixing time constants estimated from CFD calculations. Other nice work in this field includes the PhD of Christian Lindenberg of ETH Zurich, the institution where Professor John Bourne completed much of his work on micromixing. Integrated, predictive models for a system like this are useful to help practitioners to find conditions producing the right crystal number (and size) in this commonly used configuration, whether seeded or not. The scale-dependent equipment characteristics are one part and we can leverage insights from the micromixing and mesomixing research community; the DynoChem library contains tools to quantify and apply these time constants, as described in a previous post. The system-specific crystal nucleation and growth kinetics are another part and these may be fitted to solute concentration and particle number data collected during lab experimentation. Users may select from a range of rate expressions that may or may not include MSZW as a parameter; this carries some disadvantages in predictive mode as it is somewhat dependent on the conditions under which it was measured. We have integrated these elements into detailed and fast-running models when supporting customers on projects in this area. We typically use a feed-zone model, in which the zone size depends on the quality of mixing and its composition lies between that of the feed material (often pure antisolvent) and the bulk. In this zone, if nucleation kinetics are rapid, significant nucleation can occur due to high local supersaturation. Those nuclei appear before the system as a whole is supersaturated (negative MSZW) and will mostly redissolve in the bulk if the system is not yet supersaturated as a whole. They continue to be produced throughout the feed addition process, for as long as a (local) superaturation driving force exists. DynoChem simulation results using this integrated model for a system like the benzoic acid/ ethanol/ water system are shown below, using typical values for crystallization kinetics and driving forces based on supersaturation (not MSZW). Figure 2: The number of particles formed in the system is higher when the addition rate is faster; this tallies with the higher level of supersaturation reached, with a greater driving force for nucleation. The simulation includes a direct effect of impeller speed on nucleation, leading to more particles at higher agitation speed (and fast addition). Figure 3: In this model, the number of particles in the feed zone is tracked separately from those in the bulk; this number depends primarily on the quality of meso- and micromixing and there are more particles formed in the feed zone at lower agitator speeds. The number of particles in the feed zone is significantly higher with fast feeding. Note that particles are formed from the start of the addition but many of the 'oldest' dissolve in the bulk while those formed later have a better chance of remaining out of solution. Figure 4: A plot of bulk particle number versus wt% antisolvent, with the scale reduced to highlight the first signs of particles in the bulk, indicates that a large number of particles may exist even when the system is undersaturated and the number of particles can be several times higher with fast feeding than with slow. Such a particle number profile would make it more likely that a negative MSZW would be observed at higher addition rates when the FBRM (or other particle monitoring) probe may detect the larger particle number. A potentially interesting parameter to complement MSZW is the observed induction time, which in the case of the present system reduces at higher addition rates and is often well under 1 second. This underlines the importance of rapid local mixing of the feed and induction time could be used to calculate a Damkoehler type number for the system. The stochastic nature of both MSZW and induction time is well recognized and addressed again in a recent paper. From a practical point of view, all of this makes it even clearer that relying on uncontrolled primary nucleation as a means to obtain a desired crystal size (or number) can be a risky approach. The same models shown here can be used to investigate the impact of seeding and to find more robust, growth-dominated conditions in a specific system. Whatever about the quantitative and specific interpretation of the simulation results shown, the power to quickly visualize these potential impacts before experiencing them in practise is of great educational value and assists with experimental design and planning. Which reminds me of the poster I saw on the wall at a large chemical company several years ago, which read: "Don't speculate, Simulate! ".